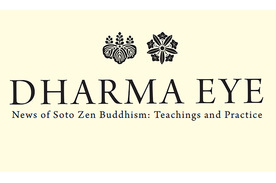 Okumura Roshi is a regular contributor to Dharma Eye, the journal of the Soto Zen Buddhism International Center, providing translation of and commentary on fascicles of Dogen Zenji’s Shobogenzo. Numerous articles are available free online. For a full listing, and the latest latest article on Ikka Myoju: One Bright Jewel, please see our DI page dedicated to these articles. This entry was posted in Study pages and tagged Buddhism, Dharma Eye, Dogen, Ikka-myōju, Okumura, Shobogenzo, Shohaku, Shohaku Okumura, Soto, Zen on December 2, 2018 by davidthompson1685. Thank you! The Dogen Institute is part of the Sanshin Zen Community. Donations through this site will be applied to Dogen Institute activities. Your bank statement will read: "PAYPAL*SANSHIN ZEN." Enter your email address to follow this site and receive notifications of Dogen Institute news by email.